Welcome to our fourth issue of The eBullet for 2008! There’s a lot of news to report, so just jump in where you can and hang on! Now until Aug. 23: The Missouri Boatride bluegrass group, featuring Darling Boy Dean Webb on mandolin, is performing a "Summer Concert Series" off the back of Larry Sifford's '49 Chevy flatbed truck, every other Saturday night starting May 3rd at 8:00 p.m. in the Kimberling City (Missouri) Shopping Center parking lot in front of the Hillbilly Bowl. These concerts are free and brought to you by the merchants at this location. If you're in the Branson area, check 'em out. * Aug. 1: David Browning’s back to rock the stadium at the Salem (Va.) Avalanche game. * Aug. 2: David Browning is a sight to see at the Asheville (N.C.) Tourists game. * Aug. 9: Doug and Rodney Dillard and their band and their TV sister Maggie Peterson Mancuso perform at the Second Annual Mayberry in Troy, a fundraiser for the Montgomery County DARE program in Troy, N.C. At least half a dozen popular Mayberry tribute artists (including David "Mayberry Deputy" Browning) will also perform. Show time at the James Garner Center is 7 p.m. Tickets are $20 for reserved seats, $15 for general admission, and $10 for kids ages 6-12. To order tickets in advance, call Jeff Branch at (910) 572-1313 or (704) 985-6987. * Aug. 16: David Browning has the Elizabethton (Tenn.) Twins doubled over with laughter. * Aug. 21-23: David Browning makes the circuit, first for Food City Family Race Night on Thurs. and then for the NASCAR scene on Fri. and Sat. at the Bristol ( Tenn. ) Motor Speedway. * Aug. 30: David Browning makes the rounds on the diamond for the Mississippi Braves game in Pearl. * Sept. 25-28: 19th Annual Mayberry Days in Mount Airy, N.C. Stars confirmed so far include Doug Dillard, Rodney Dillard, Betty Lynn, Maggie Peterson Mancuso, James Best, Jackie Joseph, LeRoy McNees and George Spence. For more info, visit: http://www.surryarts.org. * Nov. 1-6: A Cruise to Mayberry (click here for more info and photos of past cruises) to the Bahamas aboard Carnival's Fascination ship. This 5-day cruise departs from Jacksonville, Fla., on Saturday, November 1, and cruises to: Nassau, Half Moon Cay, and 2- “Days at Sea” returning back to Jacksonville on Thursday, November 6. The VW Boys are joining the Mayberry family with their mixture of Music, Magic & Comedy. Tribute artists, Ken “Otis” Junkin, Allan “Floyd” Newsome, Bob “Briscoe Darling” Mundy, Jeff “Howard Sprague” Branch, Jamie “Opie” Sullivan, Gary “Gomer” Crain, Tara “Juanita” Spath, and Samantha “The Manicurist” Miles. Others TBA. Rates start at $259 plus $179.92 Port Tax per person, based on two per cabin. For more info, call Sharon Euliss at All About Cruises in Burlington, N.C., at 1-800-832-7993. Or e-mail her at PWESJE@aol.com. By popular demand, a version of the song with Andy’s embellishments is also starting to get airplay on country radio stations across the country, so listen for that…or better yet, call in and request it. Brad Paisley says, “One of the greatest moments in my career was getting to shoot this video with Andy Griffith and getting to know him. I’ll cherish this video and opportunity to become friends with this wonderful and influential man for the rest of my life. ‘Waitin’ on a Woman’ is one of the most important songs I’ve recorded; it’s a masterpiece written by Wynn Varble and Don Sampson, and the video demanded excellence and art to match the composition. No release date has been announced yet for Play the Game, the movie Andy filmed last fall. The film also features Rance Howard and Clint Howard. Ron Howard has wrapped production of the film version of Frost/Nixon, based on the hit play about David Frost’s interviews with Richard Nixon after he resigned. It’s currently scheduled for Oscar-qualifying release on Dec. 5. Also, Ron is currently directing Angels & Demons, the sequel to The Da Vinci Code that stars Tom Hanks. The release date for that film, originally set for release this Christmas, has been pushed back until May 2009 because of the writers strike. Ron is also producer for several other projects, including an Arrested Development movie, based on the comedy series he produced and narrated, and The Changeling, which is being directed by Clint Eastwood. Another interesting Mayberry connection to this Terminator film is that Joy Ellison (Opie’s girlfriend Mary Wiggins and other characters) is the dialect coach on the film. Joy also ran into Mayberry’s Finest spokes-group The Grascals while working on a film called Peacock in Iowa awhile back. Jim Nabors gave his last planned concert of his career at the American Music Theatre in Lancaster, Penn., on July 9. Shazam…what a career! We’ll still hope that he can be coaxed out of his cozy Hawaiian paradise for an unplanned performance here and there. Meanwhile, we’re grateful for all the memorable concerts this wonderful entertainer has given us for more than four decades. 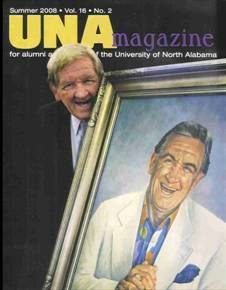 COVER BOY—George Lindsey made the cover (twice) of the Summer issue of the alumni magazine of his alma mater, the University of North Alabama. The photo was taken at thededication of the George Lindsey Archives at the University in March. There’s a very nice article about George inside as well. George Lindsey has been approached about roles in a TV pilot and a feature film. Meanwhile, his last feature film, When I Find the Ocean, is being released on DVD on Aug. 5. Rated PG. George also has just gotten back from a trip to California to see family, including a first visit with second grandson Andrew. James Best is in an award-winning movie that’s now on DVD: Moondance Alexander. James also has an entertaining new DVD that he has produced called “James Best: Hazardous Road Trip” that features shots of James visiting original filming locations for the “Dukes of Hazzard,” as well as him painting in his art studio and other activities. Find out more at http://www.jamesbest.com. And James been busy with personal appearances this summer, including DukesFest in Atlanta in June and the Western Film Fair with Betty Lynn in Winston-Salem a couple of weeks ago. Maggie Peterson Mancuso has mended well from surgery on both knees earlier this year and she’s eagerly back performing and making personal appearances. Francey Knotts (Don’s widow), Karen Knotts (Don’s daughter) and Ronnie Schell all participated in the Don Knotts Hometown Celebration in Morgantown, W.V., July 18 and 19. All were well received by audiences as they paid tribute to Don. David Browning was also on hand to honor his friend and inspiration and of course to help out with crowd control as necessary. We’re very sorry to report the death of writer Seaman (aka Si and Jake) Jacobs in Los Angeles on April 8. He was 96. (We thought we had reported his death earlier, but recently realized that we fumbled our coverage when we got out of sync with our newsletter schedule around the time he died). “…Creating a career in comedy spanning more than half a century, prolific writer Jacobs penned countless episodes of some of America's favorite TV series. “Soon, he ventured into the then-new medium of television. His sense of humor can be seen not only in his work on hit shows such as 'The Addams Family' and 'F-Troop,' but in the laughs to be found in the countless episodes of classic comedy TV hits he either wrote or co-wrote, such as 'Maude,' 'The Jeffersons,' 'My Three Sons,' 'My Favorite Martian,' 'I Dream of Jeannie,' 'Here's Lucy,' 'Chico and the Man,' 'Diff'rent Strokes,' 'Family Affair,' 'Petticoat Junction' 'Bachelor Father,' 'The Andy Griffith Show' and 'The Love Boat,' many of which he often co-wrote with his frequent writing partners Fred S. Fox and Ed James. “Jacobs' talent wasn't limited to the small screen. His feature film credits include the Elvis Presley starrer It Happened at the World's Fair (1962), co-written with Si Rose, and the George Burns hit sequel, Oh, God! Book II (1980, screenplay by Josh Greenfeld and Hal Goldman and Fred S. Fox and Seaman Jacobs and Melissa Miller, story by Josh Greenfeld). In addition, Jacobs made a career as an in-demand comedy writer, penning monologues for several comedy legends over the years. For nearly five decades, his clever wordplay helped define TV comedy as spoken by icons including Bob Hope, George Burns, Lucille Ball, Red Skelton, Danny Thomas, Ed Wynn and Johnny Carson. “Among the dozens of primetime TV comedy specials Jacobs helped pen, he may be best known to TV viewers for contributing to Bob Hope's long run of annual all-star comedy TV specials during the '80s and '90s. In 1978, he earned a Writers Guild Award (Variety - Series or Special, Musical or Comedy) for his work on 'The George Burns One Man Show,' shared with co-writers Elon Packard and Fred S. Fox. In 1980, Jacobs also earned a shared WGA nomination for his work on 'George Burns in Nashville' with frequent co-writers Fred S. Fox and Hal Goldman." In addition to his wife, singer Vicki Benet Jacobs, he leaves behind his son, Tom Jacobs, and four grandchildren, Will, Rebecca, Nathaniel and Stephen. A memorial service was held on May 9 at the Writers Guild Theater in Beverly Hills. The family has requested that donations in his memory may be made to the Motion Picture & Television Fund or the Writers Guild Foundation. 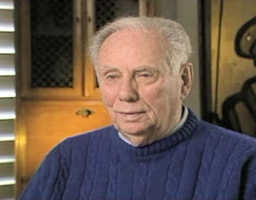 We’re also sad to report that actor Henry Beckman died June 17 in Barcelona, Spain. He was 86. Born in Halifax, Nova Scotia, on Nov. 26, 1921, Henry appeared hundreds movies and episodes of TV shows from the 1950s until as late as 2002. He often played authority figures, including in his one TAGS episode, “Aunt Bee the Juror,” in which he played the prosecutor, Mr. Gilbert. In real life, he did battle at Normandy in World War II. His career is one of those that spanned the history of TV. His credits run the gamut from westerns, comedies and commercials to cop shows, courtroom dramas and medical shows. He was also a prolific and highly regarded writer. Henry was preceded in death by Cheryl, his wife of 43 years. He is survived by second wife Hillary and two sons by his first marriage, Brian and Stuart. Despite his impressive 50 years of acting credits worldwide, Henry Beckman will always be remembered in Mayberry as the man who almost convicted Jack Nicholson, except Aunt Bee wouldn’t let him. It’s hard to get more momentous than that! Mayberry Post Office Pigeon Forge, Tenn.
That brings our total number of chapters founded to 1,328. If you’re interested in starting a chapter of TAGSRWC, all you need to do is pick a name that has not already been chosen, and submit it with a list of your founding members by postal mail. 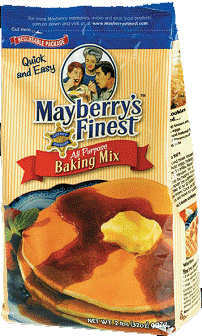 The full line of canned goods and baking mixes is now available in 1,500 to 2,000 stores and also online (with the additional offering of mail-order gift baskets) at the Mayberry’s Finest Web site at http://www.mayberrysfinest.com. The Web site currently has a partial list of stores and precise locations (organized by state) in its Foley’s Market section. Look for them in even more stores soon! 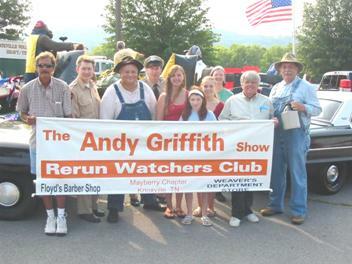 TRIBUTES TO MAYBERRY—Mayberry tribute artists entertained throughout the day in Graysville. 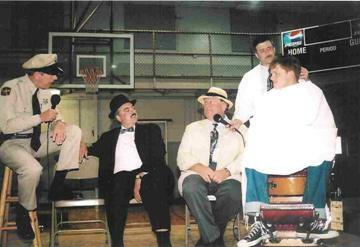 Seen here in an evening barbershop sketch are (l-r) Mayberry Deputy David Browning, Jeff Branch as Howard Sprague, Kenneth Junkin as Otis, Mike as mic, Allan Newsome as Floyd and Jamie Sullivan as Opie. A ONE AND A TWO AND AWAY WE GO—Rodney Dillard closed out the day with an intimate concert. 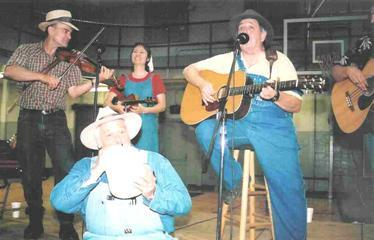 He’s helped on this number by Briscoe (Bob Mundy), husband-and-wife fiddlers George and Becky Giddens, and Jeff Branch (partially pictured) on acoustic bass. BANNER DAY—Members of Mayberry chapter (Knoxville, Tenn.) look all keyed up for their part in the Fourth of July parade in Farragut, Tenn. See more photos and info about the chapter at http://www.mayberrychapter.com. 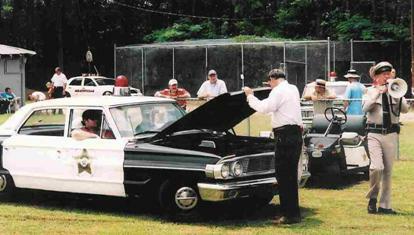 Bunches of chapters (“bunches, bunches!”) turned out along with other Mayberry and race fans for the Eighth Annual Mayberry Squad Car Nationals and Fourth Annual Mayberry Day in Graysville, Ala., on July 13. Among the chapters represented were the sponsoring Mayberry Minutemen (Graysville) and “Hearty Eatin’ Men and Beautiful, Delicate Women” (Tuscaloosa, Ala.). Also represented were Barney chapter (Greensboro, N.C.), Mother Figure (Huntsville, Ala.), “You Better Put a Buckeye in Your Pocket and Do the Incant for a Sore Foot” (Bessemer, Ala.), “I Ain’t No Rockefeller” (Bristol, Va.), “$6 a Week and What Do I Get? Heartache! Nothin’ But Heartache!” (Indianapolis, Ind.) and Andy chapter (Nashville, Tenn.). In all members and chapters from seven states were spotted during the day. The Taylor Home Inn, a B&B operated by Mayberry Troop #44 chapter (Clear Lake, Wis.) is being featured in the Fall issue of Out Here, the quarterly magazine of Tractor Supply Co. The issue will be at store locations nationwide in October, and a version will be online as well. You can learn more about this amazing B&B at http://www.taylorhomeinn.com. Several chapters attended the Don Knotts Hometown Celebration in Morgantown, W.V., a couple of weeks ago. Among those attending from out of state were Barney chapter (in the person of Neal Brower, who did a book-signing on Sat. ), “I Ain’t No Rockefeller,” Johnny Unitas of the Baltimore Colts (Stevensville, Md.) and Foley’s Market (La Salle, Ill.), whose Joyce Kernan won the trivia contest. Chapters from West Virginia and neighboring states were planning to attend as well, but we haven’t heard for sure yet which ones actually were able to attend, other than “Men and Blabbermouths” (Culloden, W.V.). We’ll have a more complete report on the event in our September issue. This quiz is one that we’ve run in the last two issues because of distribution problems with the first of those issues. We took entries for the original deadline and for the extended deadline, and are going to award two prizes instead of one—that is, one prize per deadline. 1. 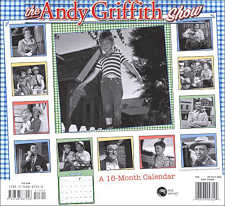 Any two of these three: Andy is seen in his home repairing a lamp during “Aunt Bee’s Romance” when Roger Hanover visits, also when Clara charges in with her sword to defend her ancestor’s role in “The Battle of Mayberry, and when he’s working on a lamp plug as Opie comes in the door to tell him about getting his drugstore job. 2. “A bolt from the blue” is how Floyd describes the decision of the Robinson family to sell the barbershop building in “Floyd’s Barbershop,” and Aunt Bee says that her winning $5 in “Goober’s Contest” was like “a bolt out of the blue.” Both winners got both right. 3. 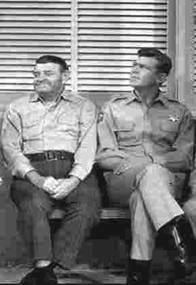 At the dinner table during “The Battle of Mayberry,” Opie says that Johnny Paul once dropped his bacon and tomato sandwich on the ground. 4. Mary Scobey once gummed a cookie with Andy Taylor when “Andy Forecloses” on the Scobey family. 5. Two people seen driving the Darling family’s truck are Briscoe Darling and, in “The Darling Fortune,” Charlene Darling Wash. BONUS: The proposed action that would save Mayberry an estimated $3,628 is Howard Sprague’s idea in “Politics Begins at Home” to build a bridge over Parker Creek at Baker Street instead of at Old Ranch Road. Old Lady Crump is going to relax for what’s left of her summer break and not do a quiz this issue. She might even continue her sabbatical in the September issue to give her pupils a chance to focus on the Mayberry Days Trivia Contest, the Super Bowl of Mayberry trivia. (And she might need to brace herself for that contest as well.) But you never know, maybe she’ll throw a quick pop quiz out there in September. That’s the thing about Miss Crump. You just never can tell what she’s going to do on a whim. The next issue of The eBullet is scheduled for mid-September, with a Weaver’s Newsletter planned for the last half of August.